I really want some ice cream now, but there's just one problem. You see, I had a "signature" milkshake for lunch. Not sure what that means? No worries, I didn't either... nor did the nice lady behind the counter. She pulled out a menu and sure enough there was a picture of the new signature shakes. Cookies & Cream style milkshakes? Sign me up!! but let me clarify something first. We're a little wacky here in New England. Some places sell frappes (pronounced fraps) and some places sell milkshakes. Now good luck getting the same answer out of two people as to what the difference is. To make matters worse, some unique places try to mess with your brain so that you have absolutely no idea what's going on. Friendly's would probably be one of those places. Now if you go read Friendly's menu, it says their Fribble is a super-thick, soft serve shake yet their double thick milkshakes are served in their frappe cans. Wait, what? How many terms can you throw at me before my ice cream loving brain throws a gear, possibly permanently. Still following? Ok, because it gets worse. Now when we usually go to friendly's, I generally stick with the Fribbles because they are twice as thick as the double thick milkshakes, which are actually pretty thin. Actually it is worse than that. Their "double thick" shakes are some of the thinnest shakes around. The only thing thinner are the fake shakes from DQ. Now I'm not picking on the product here, I like the fact they order two styles of shakes, I just think they need to work on their terminology. side tip here: if your first job happens to be the McD's drive-thru and some people ask for a frappe even though you only have milkshakes, don't argue with them, it ain't worth it. Should I get to the review now? Oh, alright, if I must! Let's see what it really looks like. 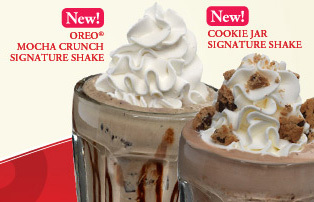 This is the new Cookie Jar Milkshake. It's made with Chocolate Chip Cookie Dough ice cream, chocolate chips and Chips Ahoy! Cookie pieces. There is also a new Oreo Mocha Crunch made with Vienna Mocha Chunk ice cream, coffee & chocolate topping and Oreo cookie pieces. I don't really do mocha, so cookie jar was the way to go. The good news is that this comes with one of those giant straws. The bad news is that it still managed to get jammed on my first sip. Ok, not a good sign, but could be a fluke... or not, it happened throughout the treat. Of course, as soon as it un-jams, it goes does real easy because there is just so much MILK in this MILKshake. It's not bad, it's got a decent flavor, but you think milk, then ice cream. It just seems like a waste really. I'm very much into the COOKIES part of cookies and cream... sorry, I'll stop with the caps, I'm just trying to emphasize the milk taste which is up front and center on this treat. It's also kind of weird crunching chip ahoys as you drink a shake. They aren't huge chunks, but they are big enough that you need to crunch now and then. At least there is no mistaking that Chips Ahoy taste. Ahhhhhh, so that must have been what was getting jammed in my giant straw. Now how come that doesn't happen with my B&J Milk&Cookies milkshake? You can also see the chocolate chips they are talking about. Just had a funny thought: They use chips ahoy instead of an oreo-type cookie, yet this still has a similar flavor to every other cookies & cream milkshake I've ever had. Was this worth $4.99? Probably not. It's just not thick enough. I'll probably stick with a Fribble next time and save my milkshake time for pretty much any other ice cream shoppe that has a better ice cream to milk ratio. Awwww crud.... I just checked out the nutritional info. My large looking milkshake cost me 1050 calories and 130% of my saturated fat for the day. What have I done? I'd go run about, ummm, 37 miles if it wasn't after 10PM. Man o' man, that's just evil...... very evil.... though it does explain why I was full for awhile. haha! sorry to laugh at your pain regarding the cal content, man. but you have to admit it's a bit funny. well, maybe not for you. at least, i'm assuming, they didn't try to pull like a "100 cals" (per serving), with each milkshake containing 10.5 servings. that would've been downright evil. HAHAHAHA that would be awesome!! "it's only 10 calories per sip!"